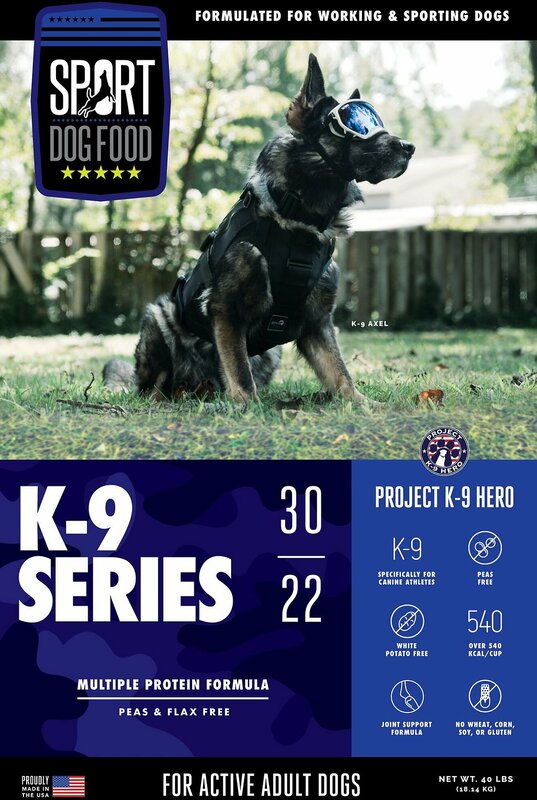 Give your doggie athlete the complete nutrition he needs with the Sport Dog Food K-9 Series Project K-9 Hero Multiple Protein Formula Pea-Free Flax-Free Dry Dog Food. Formulated with multiple protein sources and a balanced blend of fats and carbohydrates, it produces a complete diet for highly active dogs. Sport Dog Food's pea-free formulas contain complete protein from low-ash animal sources, while keeping carbs low and fiber high. This meal is perfect even for pups with sensitivities since it has no artificial preservatives, flavors, fillers or by-products. Plus, it’s made in the USA with organic, American-sourced ingredients and never any corn, soy, eggs or egg product. It wasn't easy to exclude ingredients like peas, wheat, flax or white potato, but Sport Dog Food did it—all for the love of your dynamic pup. 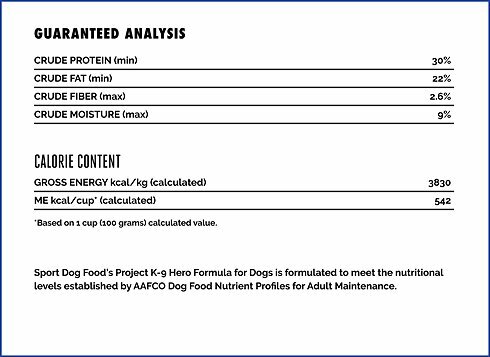 Multiple-protein, high-calorie meal was created to support complete, balanced nutrition to fuel highly-active dogs. Pea-free formula excludes peas, pea protein, pea starch and pea fiber, filling your pup instead with the wholesome goodness of low-ash protein, fibrous sweet potato, and energy-boosting cassava. Proprietary blend of Zinpro Availa Pet Performance Minerals and Diamond V Probiotics to improve your active dog's health, metabolism, skin, coat, digestion, and more. Ideal for dogs with digestive sensitivities with no artificial preservatives, flavors, fillers or by-products. Made in the USA with organic, GMO-free American-sourced ingredients and never any corn, soy, wheat, eggs or egg product. 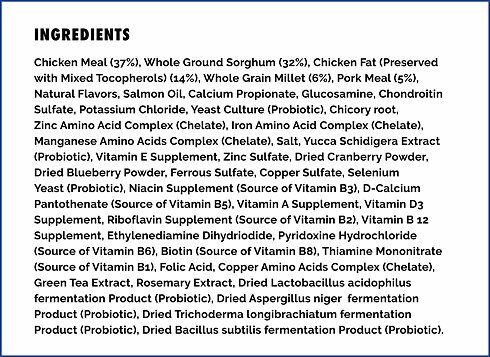 Chicken Meal (37%), Whole Ground Sorghum (32%), Chicken Fat (Preserved With Mixed Tocopherols) (14%), Whole Grain Millet (6%), Pork Meal (5%), Natural Flavors, Salmon Oil, Calcium Propionate, Glucosamine, Chondroitin Sulfate, Potassium Chloride, Yeast Culture (Probiotic), Chicory Root, Zinc Amino Acid Complex (Chelate), Iron Amino Acid Complex (Chelate), Manganese Amino Acids Complex (Chelate), Salt, Yucca Schidigera Extract (Probiotic), Vitamin E Supplement, Zinc Sulfate, Dried Cranberry Powder, Dried Blueberry Powder, Ferrous Sulfate, Copper Sulfate, Selenium Yeast (Probiotic), Niacin Supplement (Vitamin B3), D-Calcium Pantothenate (Vitamin B5), Vitamin A Supplement, Vitamin D3 Supplement, Riboflavin Supplement (Vitamin B2), Vitamin B 12 Supplement (Vitamin B12), Ethylenediamine Dihydriodide, Pyridoxine Hydrochloride (Vitamin B6), Biotin (Vitamin B8), Thiamine Mononitrate (Vitamin B1), Folic Acid, Copper Amino Acids Complex (Chelate), Green Tea Extract, Rosemary Extract, Dried Lactobacillus Acidophilus Fermentation Product (Probiotic), Dried Aspergillus Niger Fermentation Product (Probiotic), Dried Trichoderma Longibrachiatum Fermentation Product (Probiotic), Dried Bacillus Subtilis Fermentation Product (Probiotic). For Adult dogs, feed Sport Dog Food either dry or moistened with water. Begin with the recommendations provided above and adjust to maintain body weight. We recommend feeding your dog at least twice a day. The feeding chart above is the total amount of food we recommend for the day. Divide the total by the number of feedings you will provide your dog. Reproduction: Provide increasing amounts of food the latter half of gestation. The amount may be twice the normal intake. Feed to consumption during lactation. 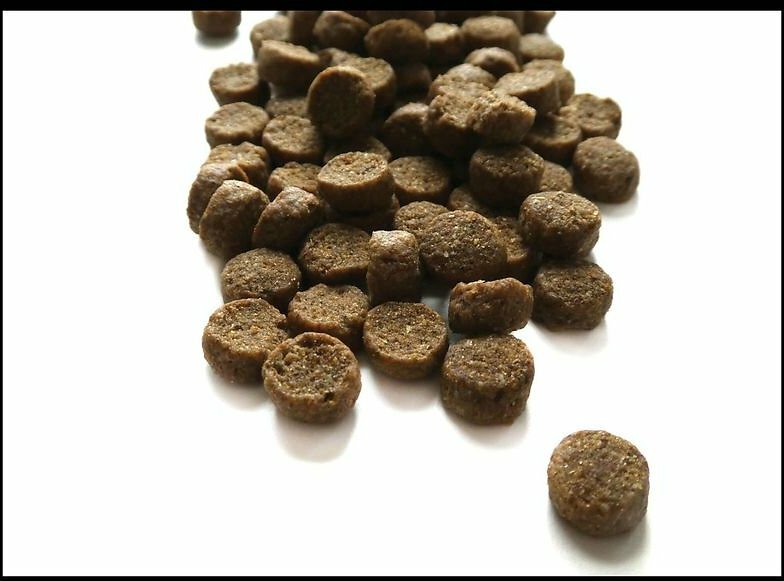 Growth: Introduce dry food around the 5th week. Always provide a source of clean fresh water. Feeding amounts listed are based on an 8 oz. standard measuring cup. When switching your dog’s diet, we recommend that it be done gradually over a 10-14 day period. My four dogs absolutely love this. I have a hound mix, lab, and two shitzus and I’ve always had to coax them to eat the dry and blend with wet food. I’m starting to think I can eliminate the wet all together. The 10 month old hound loves it as does my 13 year old shitzu! Skin allergies for a couple of them are now completely gone. Please don’t atop carrying this!! Our border collie who tested positive for food allergies to just about everything under the sun loves this food. His hot spots have subsided and hes having no trouble maintaining a healthy weight. Love this food! Thanks to chewy for making it so easy to sort out food sensitivities. I have 2 VERY picky and sensitive shepherds... and on top of that I have a pit bull and a French bull dog. All of which enjoy and gained a lot from this food ! Better poop and less quantity of poop was the biggest difference. Secondly, my dogs have never really been interested in eating and would just eat to eat. However, now they can’t wait to eat and LOVE this food. I’m 100% staying with this food. All of my odd and sensitive pups love this food and they all look and feel 100% healthier. It's hard to know what food is safe to feed our dogs. Sport Dog Food is really trying to fill that gap with protein from meat, rather than legumes. For now, it's my choice for my breeding and competing dog. I’ve used Sport Dog Food in the past, this is the first bag since their formula change and the dogs love it! It’s hard to keep weight on active, working Malinois and GSD and this food measures up! The dogs are driven for it in training and their gut agrees it’s awesome. 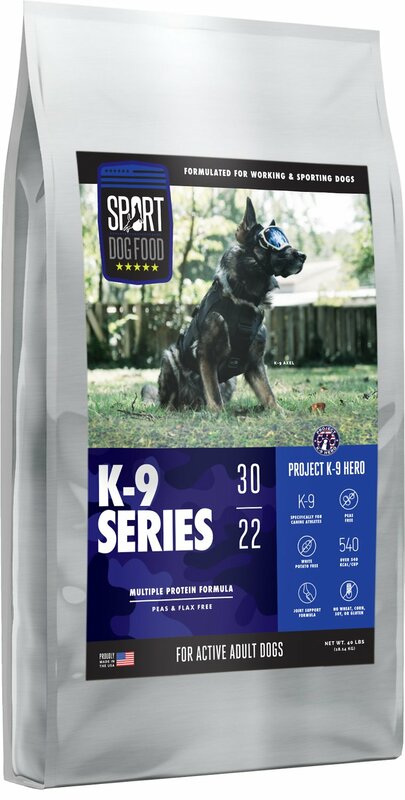 Totally recommend for those looking for higher protein and fat food for your working dog. I’ve been looking for a dog food that fit my adult GSD dietary needs as he has many allergies and sensitivities. I had found one prior to this but he was always hungry and was not gaining the weight back he lost before we knew about allergies. This food is great and at a great price compared to other LIDs. Awesome food and a lifesaver with multiple big dogs. Has really helped with the dandruff and itching which is why I bought it. He really likes it. I have a dog that eats anything GSD but for some reason he doesn't want to eat this food..